Most disaster recovery strategies focus exclusively on the data center but most users use laptops and other endpoints to get their work done. And those endpoints often have unique, business critical data on them. 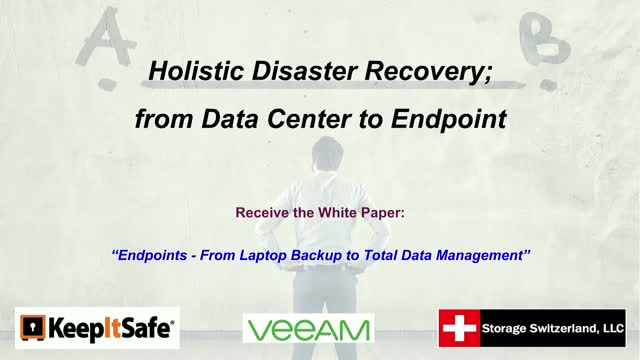 Data center servers and storage as well as endpoint need inclusion into the organization’s disaster recovery plan. Today disasters like ransomware and other cyber-threats can impact both data center servers and user endpoint. And, both endpoints and data center servers are susceptible to “minor” disasters like hardware failure and software bugs, which at the time seem major to those impacted. Endpoints, unlike servers also face another type of disaster loss or theft. Register now for our upcoming webinar where experts from Storage Switzerland, Veeam and KeepItSafe discuss how to create a disaster recovery plan that covers all of the organizations digital assets.